On my final full day in Seoul I took a tour of the Korean DMZ that was organized by the USO and a company called Koridoor. Understandably, you can only visit the DMZ as part of a tour group, seeing as how the Korean border is a highly controlled and potentially dangerous place. It’s only a 45 minute bus ride from Seoul to the DMZ, which really gives you a good understanding of just how close South Korea’s capital is to the border and why Seoul would likely be badly damaged if war ever broke out. The first part of our tour took us through Camp Bonifas and we passed near a village that’s close to the DMZ. From what we were told, the villagers are farmers who are paid by the government to cultivate the land and are completely exempt from taxation and military service, however they also don’t have as many freedoms as other Koreans and have hardly anything to spend their money on. Soon we came to the Joint Security Area (JSA) where the two Koreas actually meet. 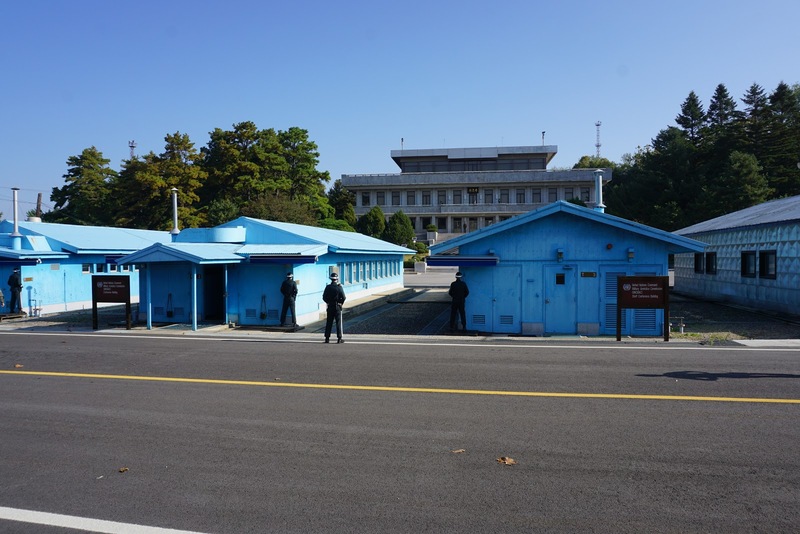 The DMZ extends for two kilometers in either direction from the border and is full of mines, but at the JSA there is a small cluster of buildings right on the border that are meant to facilitate talks between the two nations. Blue buildings belong to the United Nations and gray buildings belong to North Korea. Right on the border itself are six meetinghouses: three blue and three gray. A concrete slab in the middle of that row of six buildings marks the border. About 100 yards away from us, in front of a large building we could see a single North Korean guard. In reality there are many more North Koreans at the DMZ, however nearly all of them are out of sight. One of those hidden guards is apparently in the building right behind the visible North Korean guard there is a second guard whose only job is to shoot the visible guard if the visible guard ever tries to make a run for it and defect. In the distance I could hear some sort of music playing, which I assume was propaganda music but I don’t know which side was playing it. Since we couldn’t move around much I wasn’t able to get the angle I wanted for my photos, but I got a few half decent shots like the one below. We next entered one of the blue meeting houses. 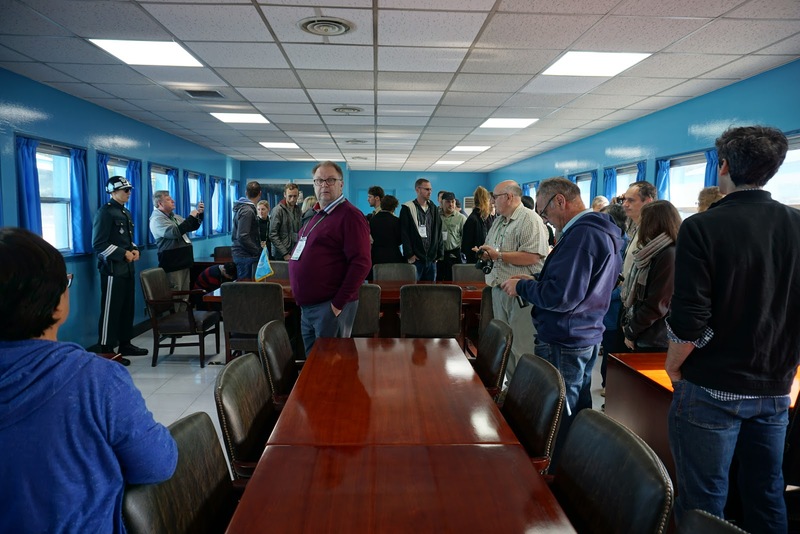 Inside are tables and chairs used during talks, and since it sits right on the border you are technically inside North Korea if you walk to the far side of the room. A pair of South Korean guards keep watch over the room and we were told not to interact with or stand directly next to them. I walked to the far side and thus entered North Korean territory, however inside that room it doesn’t really hit you that you’re in North Korea. Below is a photo of what the room looked like. Soon our time was up and we had to leave the JSA. As we were walking to our bus I saw a very expensive BMW pull up and a civilian got out. The soldier who was walking with us had explained earlier at Camp Bonifas that the villagers who live near the DMZ oftentimes buy fancy cars because those cars are among the very few luxuries they are actually able to purchase, so I assume that civilian was one of the people living by the DMZ. 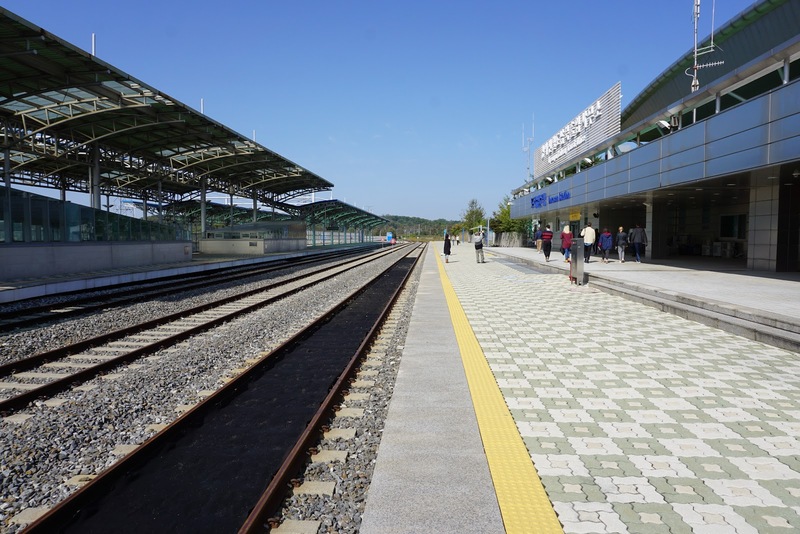 The next place our bus took us to was Dorasan Station, the final South Korean train station on the train line that used to connect North and South Korea but is currently not in service. South Korea still hasn’t given up hope on Dorasan one day being in use again, so it’s kept very tidy for a place whose only visitors are tour groups like mine. Out on the train platforms you can see a train car that was imported from Germany that was originally used as a peace car during the Cold War. South Korea used it during the years that the train line operated but now it sits outside as a mini-museum. After a lunch break our tour proceeded to a lookout post from which we could stare out onto North Korea. The border line curves back and forth across the land, but it’s not too hard to tell where the North Korean side is because North Korea cut down most of the trees on its side of the border, both for fuel and to create an open no-man’s land. 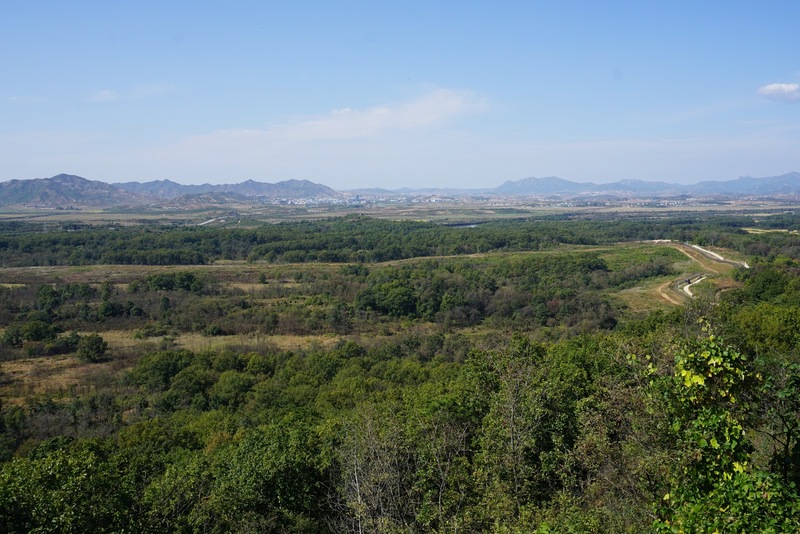 The rail line from Dorasan Station could be seen off to the left and to the right you could see the giant North Korean flagpole tower and the empty village that they use to broadcast propaganda across the border. Far off in the distance was North Korea’s third largest city, whose name escapes me at the moment. It had a number of taller buildings, though from what we were told, none of them have elevators because North Korea can’t generate the electricity that would be needed to power them. South Korean propaganda music was playing over nearby loudspeakers, so this might have been what I heard at the JSA but I’m not sure. It was an odd feeling to be staring out at what is probably the most repressive country on the entire planet. To this day I still can’t quite describe it. The final part of our tour that day was a visit to the Third Tunnel. In the years after the signing of the ceasefire that (mostly) ended the Korean War, the North Koreans dug multiple tunnels under the border that would have allowed them to funnel thousands of troops into South Korea in the event of war breaking out again. The Third Tunnel was the third such tunnel that the South Koreans discovered, hence the name. It is deep underground and getting to it involves a long walk down another tunnel that South Korea dug so that people could go down and see it. No one’s sure just how many of these tunnels exist and it’s thought that there are many more that haven’t been discovered yet. No photos are allowed in the Third Tunnel, so I have nothing to show you of it, but I can give you this photo of the unification monument just outside of the tunnel’s entrance. 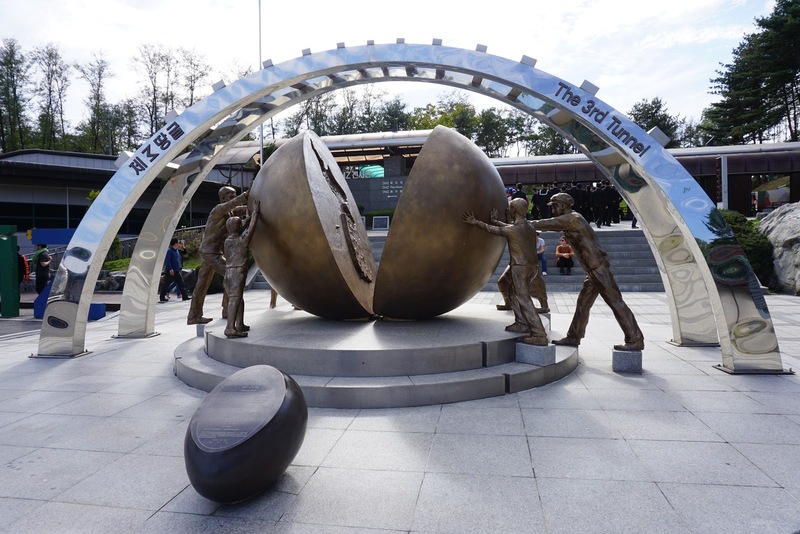 Koreans are pushing two halves of a sphere back together, with South Koreans on the left and North Koreans on the right. When we finished our visit at the Third Tunnel it was time to head back to Seoul. We drove along the river that flows through Seoul and out into the ocean and I couldn’t help but notice that the riverbanks were covered in barbed wire and watch posts. The Cold War may officially be over in most of the world, but it is still very much alive in Korea. If you are ever in South Korea and have the chance to take a DMZ tour I’d highly recommend going. It’s one thing to talk about North Korea—it’s quite another to see it for yourself.